The new 60X Stack-and-Shred Hands Free Shredder by Swingline allows you to just toss in your materials to be shredded and walk away. Automatic shredding means you spend less time at the shredder and more time doing what's important. The Stack-and-Shred 60X will accept up to 60 sheets of paper at a time, and shreds at a rate of 5 feet per minute. Plus, you can manually shred up to 5 sheets at once, as well as credit cards. User friendly features include super quiet operation, LED cool-down indicator light, and a 4 gallon pull-out bin with window makes it a snap to empty when full. The Swingline Stack-and-Shred 60X assures your confidential information stays safe, while keeping your shredding tasks easy and less time consuming. Cut Size: 3/16" x 1 3/4"
I've been over and done with a lot of shredders for my office. This thing really works, bought another one for my house. We fill it to capacity at least twice per day. Introducing the new Stack-and-Shred 60X Hands-Free Shredder. It’s a better way to shred. The 60X is perfect for personal use, shredding up to 60 sheets of paper automatically. The patent-pending hands-free auto-plus technology means that shredding tasks are now as easy as stack, shut, done. Waiting on your shredder is a thing of the past. The Stack-and-Shred 60X features cross-cut shredding and can even shred credit cards. While the manual feed is perfect for single sheets, thick, glossy or folded pages. It can even shred staples and paper clips in any corner. The Stack-and-Shred 60X also features an easy-to-use interface and compact design, tailored for under desk use. Coupled with the 60X’s quiet performance, it’s clear why the Stack-and-Shred is the best choice in its class. Don’t waste your time waiting in front of a shredder when you can be doing something else. It’s time to delegate the shredding to your shredder with the new Stack-and-Shred 60X from Swingline. Hi! I’m Lorie Marrero and today’s clutter video tip is about everybody’s favorite subject – doing your taxes. Everyone asks me about the perfect system for doing this very dreaded chore, and I want to make a couple of distinctions for you today. First, there is a big difference between doing your personal income taxes and doing taxes for a small business. For a small business, you do have to keep every receipt and you have to have that entered into some accounting software and be very business-like about it. But for your personal return, most people do not need to keep every receipt for every grocery bill or every pack of gum that they buy or every tank of gasoline. It really isn’t necessary. What you need to focus usually most on are the year-end statements that you receive usually in January for your mortgage company and your employer and any contracted work that you do, and also any donation receipts for good will or other things like that that pertain to your return that are going to be necessary directly when you are filling out that tax return. So what we have found is for most people, most households, one folder is adequate to hold all this information throughout the year. The other distinction I want to make for you today is the difference between action papers and reference papers. So this is my income taxes file that I have in my action file drawer. And then I also have a file cabinet that’s called my reference filing cabinet, where all of my past paperwork that isn’t recent, relevant or anything that I really need to look at very often, that stuff is all put away. And the action file drawer is the one I spend my time in. It has my projects, bills to pay, other things like that are my active papers. Big mistake people make is mixing up the two. So having your current active tax year in your action file drawer is an important separation that you can make. And, again, just collect all that stuff throughout the year and then you’ve got it all in one place when you’re ready to do your tax return. Now, that leads me to the other question that most people ask me, and that is, “How long do I need to keep all of this paperwork?” Most experts agree that you should keep tax supporting documents for six to seven years and the tax returns themselves indefinitely. Now each year when you do your tax return, it’s a great time to purge your files from the years past. And, of course, you need a good shredder to do that. I get to see all of the cool new tools that come out and I’m very proud to actually represent this new shredder that’s very different. It’s hands-free. You can take up to 60 sheets of paper even if they’re stapled or paper clipped. And you can put them on the top here and shut the lid and it does all of the feeding through of the paper for you. So you can be more productive and get on to doing something else, like finishing your tax return, and it does all the work for you. This is the Swingline Stack-and-Shred 60X. Now, if you’d like to save some more money on your tax return this year, we have a resource for you on our free tips page at clutterdiet.com/freetips. On the left side, you’ll see our “Donate for Dollars” tracking sheet where you can track all your donations to goodwill and make sure you’re getting the maximum fair market value for all of those deductions and saving a lot more money. See you next time and may you always be happy and grateful for having more than enough. Transcript: Speaker 1: Thank you for tuning in on this 60X training video. The 60X is one of four exciting new Swingline Stack-and-Shred shredders for the year 2012. I’m Steve Frei and I’m here to introduce the video, and really it’s such a thorough video that I’m just simply going to turn the machine on here in the back and turn on the video for you, and then I’ll be back in a few minutes. Speaker 1: Thank you for tuning in on this 60X training video. The 60X is one of four exciting new Swingline Stack-and-Shred shredders for the year 2012. I’m Steve Frei and I’m here to introduce the video, and really it’s such a thorough video that I’m just simply going to turn the machine on here in the back and turn on the video for you, and then I’ll be back in a few minutes. Speaker 2: Introducing the new Stack-and-Shred 60X Hands-Free Shredder. It’s a better way to shred. The 60X is perfect for personal use, shredding up to 60 sheets of paper automatically. The patent-pending hands-free auto-plus technology means that shredding tasks are now as easy as stack, shut, done. Waiting on your shredder is a thing of the past. The Stack-and-Shred 60X features cross-cut shredding and can even shred credit cards. While the manual feed is perfect for single sheets, thick, glossy or folded pages. It can even shred staples and paper clips in any corner. The Stack-and-Shred 60X also features an easy-to-use interface and compact design, tailored for under desk use. Coupled with the 60X’s quiet performance, it’s clear why the Stack-and-Shred is the best choice in its class. Don’t waste your time waiting in front of a shredder when you can be doing something else. It’s time to delegate the shredding to your shredder with the new Stack-and-Shred 60X from Swingline. Speaker 1: Thank you for viewing the 60X training video. I hope you enjoyed it and I’m sure you picked up on the features the product. This is going to be the price-leading product and the highest velocity product for Stack-and-Shred as it comes to market in 2012. And, again, if you remember from the overall training video, when it comes to deskside personal shredding, when you put all three Stack-and-Shreds together – the 100X, the 80X and the 60X, all made for personal shredding – you hit three great price points and have the opportunity to consolidate a very large market. 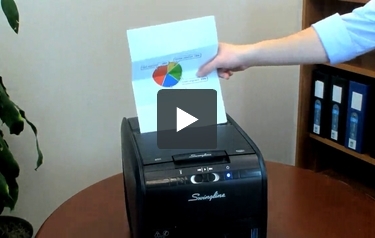 The Stack-and-Shred 60X can shred up to 60 sheets automatically. All you need to do is place your paper in the machine and shut the lid. 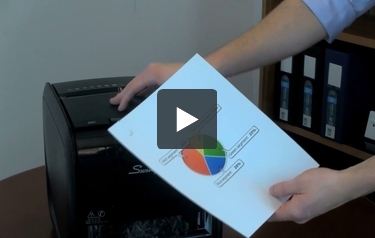 If you prefer to shred your document manually, you will be able to dispose of 5 sheets at once. There is a separate feed opening for manual shredding. This machine is a cross-cut shredder and it has a Level 3 security rating. The shreds will measure 3/16" x 1-3/4" so you can count on your personal and proprietary information being protected. The Stack-and-Shred 60X can shred stapled documents so you won't need to waste your time on staple removal. This machine can shred credit and debit cards as long as you place them in the feed opening on the top of the device. If you ever encounter a paper jam when using this shredder, make sure you take advantage of the reverse mode. It will help you take care of the jam so you can continue shredding. The Stack-and-Shred 60X has a 4-gallon waste bin. The waste bin can be pulled out like a drawer, so getting rid of your shreds is quick and easy. You will notice that the bin has a window. This makes it easy to see when it's time to get rid of your shreds. This device is pretty compact so it's a great choice for smaller work areas. You should be able to stick this machine under your desk for easy access. Also, this shredder operates quietly so it won't disturb those around you. Finally, the Stack-and-Shred 60X comes with a 1-year warranty so you can have it fixed or replaced if necessary. This shredder can shred continuously for up to 10 minutes but it then needs to rest for 40. Thus, this machine is best for personal use. The Stack-and-Shred 60X can't shred CD's or DVD's. If you get this machine, you will need to find a secure way to get rid of those items. This machine doesn't have anti-jam technology, so make sure you don't try to shred too much at once. Hopefully this won't be too difficult since the device has a high shredding capacity. Overall, the Swingline Stack-and-Shred 60X is a fun little shredder that's good for personal use at home or in the office. This machine makes it really easy to shred a stack of documents and the 60-sheet shredding capacity can't be beat. While this device does have some weaknesses, they shouldn't be problematic if you need to shred your documents occasionally. If that's the case, check out the Stack-and-Shred 60X today to determine if it's right for you.